This past week I made progress on all the blocks for my Desert Donkeys quilt. My husband even said how cute those little burros were and he doesn't usually take much of an interest in my quilting. Speaking of quilting, I hope to get this cutie quilted up soon. I have the backing and binding all ready to go! I also got a surprise this week when this Happy Mail arrived. I ordered fabric from Clinton Modern Creative last month, but some of my items were pre-order. So I forgot all about it! It makes me so happy to see your creations made using my patterns! 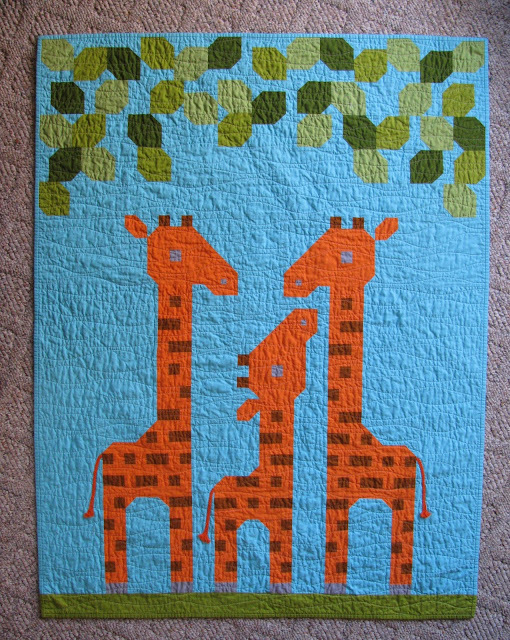 This Giraffe Family quilt was made by Becky. She wrote to sent me these photos and said, "I really enjoyed making your quilt. I’d like to make foxes in the Birches, too. Thanks for such a well written pattern." And then she gave me permission to share it here on the blog! The backing is perfect for this quilt. And, of course, I am a big fan of the wavy line quilting! What a clever idea! I love these adorable braided tails she added!!! Thank you so much for being willing to share your beautiful finish with us Becky!!!! How was your past week? Are you getting ready for a handmade holiday? If you're looking for some fun 12" quilts blocks that can be used for pillows, table runners or Christmas decorating, please check out the Have a Jolly Little Christmas QAL page here. In appreciation for all your support throughout the year, I want to thank each and every one of you. There is a sale going on in my shop. 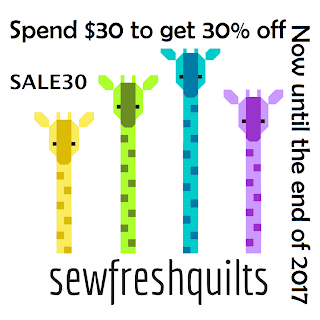 SALE30 will get you 30% off any purchase of $30 USD or more for the remainder of 2017. Those donkeys are definitely very cute! The giraffe fabric is perfect for the backing of the giraffe quilt! Those cacti are so cute, and no prickles! 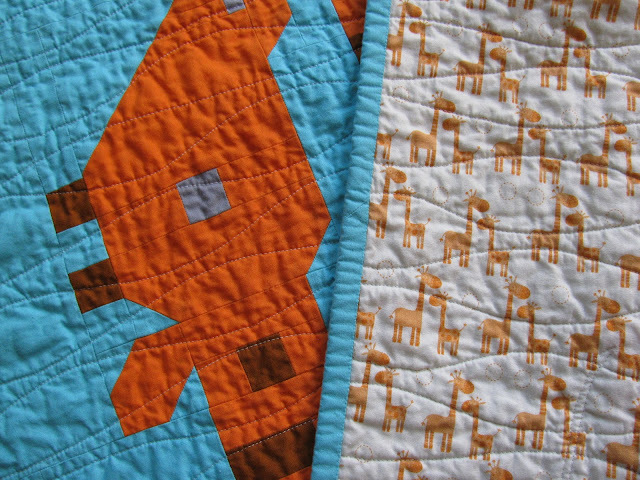 Becky's Giraffe quilt is so super cute with the braided tails - ingenious! Beautiful happy mail - and cute new donkey quilt design. Love the big eyes on them! I love the new stash pieces. Oh fabric, what would we be doing without fabric and sewing? probably getting into worse mischief like skate boarding or surfing, or deep sea fishing, or extreme hockey. 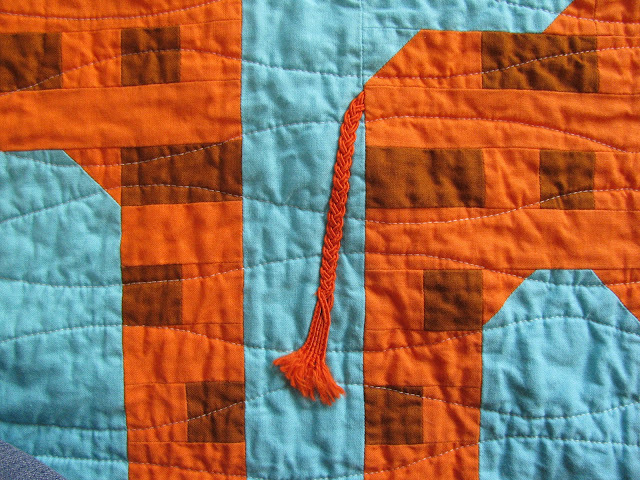 I love Becky's quilt and the cutie tails. This quilt is so epic. One day I will make one. Lorna, Once again you have outdone yourself with those adorable donkeys. Thanks so much for so generously sharing your talents and affording us a chance to "link-up". I'd happily wag my tail for those Alison Glass gorgeous fabrics and that tail is so much fun - so playful. You have done it again with your newest design! I love all your patterns and wish I could find time for all of them, but this one goes to the top of the list. Thanks for your fresh perspective. I love the dimensional tail of the giraffe. Oh, the cactus! With that hot pink flower...just yummy! Super cute giraffe quilt, love the tail - what a brilliant idea! 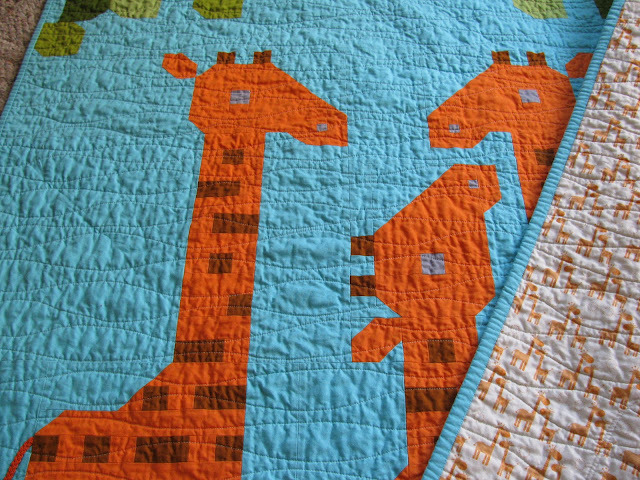 Thanks for the compliments on my Giraffe Family quilt. I thought it was going to be a lot of work, but Lorna makes it so easy. It’s so nice to find patterns with all the details that is needed and such clear instructions. Thanks Lorna! Loving the donkeys. Cute Giraffe Family. I've got the fabric cut out for my version. Hoping to get some sewing done this weekend. Thanks for all the compliments on my giraffe quilt! I've been so busy with family coming in for the holidays and having the flu recently that I hadn't had time to revisit this page. Lorna is the quilt pattern queen! So talented!